Well now you can find out exactly what happened when the boys in black and white played on 30th December. 9 years ago on 30 December 2006 – Despite leading 2-0 at half-time thanks to a Lee Trundle brace, the Swans ended up losing 3-2 at Huddersfield Town in Coca-Cola League One. Trundle’s sending off in injury time completed a miserable day, which saw Kenny Jackett’s Swans drop two places to 7th in the league table. 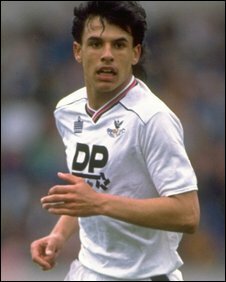 26 years ago on 30 December 1989 – The Swans beat Brentford 2-1 at the Vetch Field in front of a Barclays League Division Three crowd of 4,537. Goals from Chris ‘Cookie’ Coleman and a first ever Swans goal from Scottish striker John Hughes gave the Swans all 2 points, as they maintained their 12th place in the league table. 37 years ago on 30 December 1978 – Jeremy Charles scored the only goal of the game as the Swans beat Blackpool 1 nil at the Vetch Field in the Football League Third Division. A crowd of 12,549 saw John Toshack’s Swans consolidate their place in 3rd position of the league table.